Stainless steel finish with hybrid 510 connection. 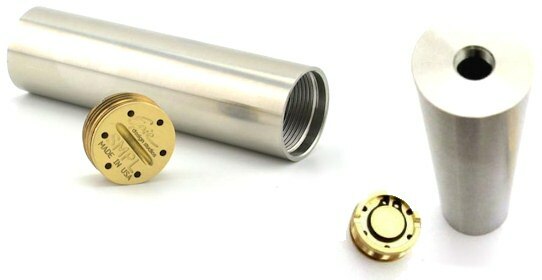 Single 18650 tube with one piece top cap and tube construction. Brass spring loaded button that is recessed into the tube. No locking ring, just pick it up and press. This mod does not use a center pin. Please use caution when attaching an RDA or Tank to ensure the negative threading does not come into contact with the battery. Screw on your RDA and look inside the tube prior to inserting battery. Adjust pin on RDA as needed. Do not over tighten the button.